We’re less than a month away from the first day of spring quarter on Monday, April 3. Get a head start on planning your schedule and save some money while you’re at it! Every quarter has an early registration date that students can sign up for classes by to waive the $10 registration fee. That’s right! Pocket ten bucks that can go toward a cup of coffee on your first day of class or directly into savings. The deadline for spring quarter early registration is Monday, March 27. Looking for something that’s not in the list? Browse the online catalog to see the full schedule of spring quarter classes. And don’t forget to sign up by Monday, March 27 to waive the $10 registration fee. See you this spring quarter! 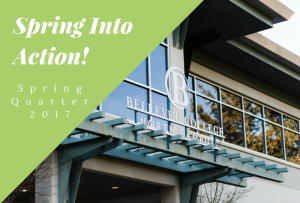 Spring Open House on Tuesday, March 28 from 5:30-7:30pm at Bellevue College North Campus (14673 NE 29th Pl. Bellevue, WA 98007). Join us as we open the doors to Continuing Education for an evening of discovery and fun. Meet staff and instructors, explore professional certificates, learn about classes, see student and instructor artwork, and experience everything continuing education has to offer. Come solo or bring your friends and family! The event is free to attend and open to the community. Please RSVP if you plan on attending.